Patna is the largest city of the state of Bihar. It is situated on the south bank of the river Ganga. This city is the capital city of Bihar state. Patna has emerged as one of the major centers of learning & hub to the institutions/universities in India. There are many well-known colleges/institutions which imparts education in the field of engineering & technology. As per the recorded census 2011, the overall literacy rate of Patna is 83.37%. In this article, we are providing complete details about Top Engineering Colleges in Patna 2019 including the list of top engineering colleges, admission process, engineering specializations, etc. We at sarvgyan.com have listed the top engineering colleges in Patna for the academic year 2019-2020. We have listed this college on the basis of their national importance. The list is comprised of all government, private institutions/universities including National Institute of Technology (NIT), Indian Institute of Technology (IIT), etc. Our expert team rated these listed colleges on the basis of several factors which help the students to choose best engineering college. These factors are academic excellence, national importance, infrastructure, placement record of previous years, quality education, student’s preference, campus facilities, faculty expertise, etc. Candidates, those seeking admission to the engineering courses, they will have to qualify JEE Main examination. This exam will be organized to provide admission to the B.Tech & B.Arch courses. The admission to the M.Tech course will be based on GATE scorecard. There are various specializations of the engineering programme which are offered by many of the reputed institutions. Some of the top engineering specializations are Electronics & Communication Engineering, Computer Science & Engineering, Electrical Engineering, Information Technology, Aeronautical Engineering, Mechanical Engineering, Civil Engineering, etc. 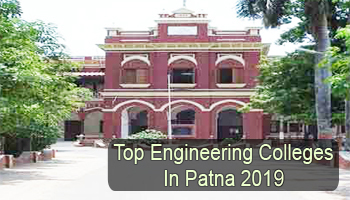 If you have any query about Top Engineering Colleges in Patna 2019, you can ask us by leaving your comments in the comment box.